Benvenuto o benvenuta al Corso di CyberItalian! In ancient times, some students had to literally "follow" their teacher and study while walking (they were called "peripatetici"). With CyberItalian you don't need to walk! Just Log In, and click MY COURSES. The picture above is a particular from The School of Athens or "La Scuola di Atene" one of the most famous paintings by the Italian Renaissance artist Raffaello (Raphael). 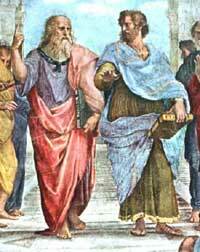 It depicts Platone, (Plato) on the left, and his student Aristotele (Aristotle) on the right, as they study, walk and discuss philosophy.